MINI-32 for PIC32MZ development board operates on a 3.3V power supply. The onboard voltage regulator allows the board to be powered directly from the USB cable. 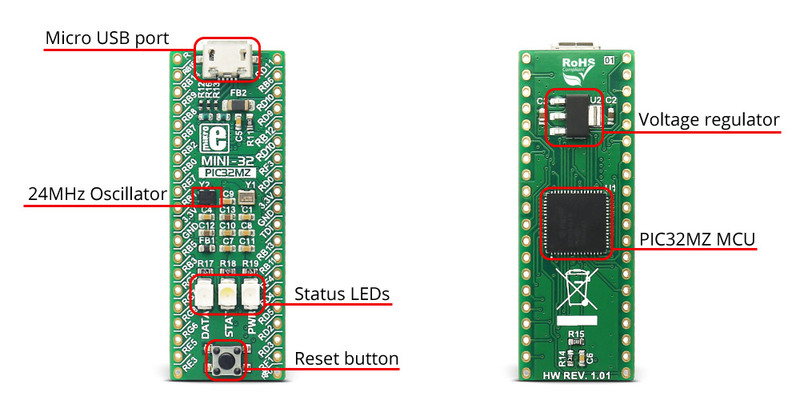 MINI-32 for PIC32MZ is pre-programmed with USB HID Bootloader so it is not necessary to have an external programmer. The board is equipped with a 24MHz crystal oscillator and 32.768kHz crystal which can be used for internal RTCC module.